Ready to experience one of life's greatest adventures? Tandem skydiving allows first time jumpers to experience the thrill of skydiving with no prior experience required! You'll be teamed up with one of our expert instructors and in the air ready to jump in about an hour! First time skydiving? Have questions? No problem! Check out the Skydive Long Island FAQ page to find answers to our guests' most frequently asked questions about skydiving in Long Island. Take your gift giving to the next level! Be a hero and give your friend or loved one a gift they will NEVER forget: a skydive! 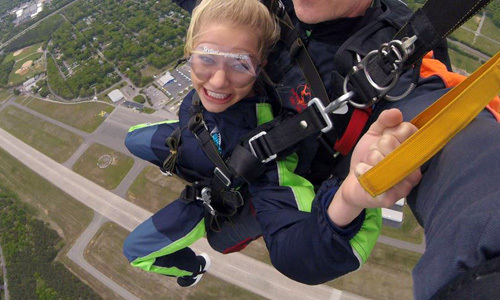 Skydive Long Island offers tandem skydiving gift certificates for every occasion. View gift certificate info and rates here. Skydive Long Island offers the area's most competitive tandem skydiving rates! Take a look at our prices and current skydiving deals and specials here. 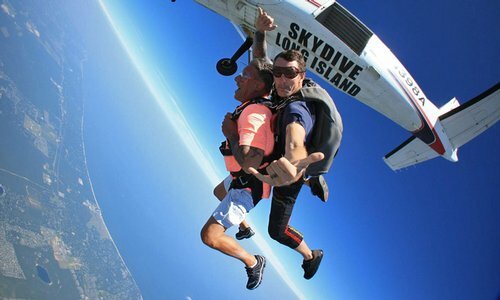 YOUR SKYDIVING LONG ISLAND ADVENTURE STARTS HERE! Welcome to Skydive Long Island, Long Island's premier skydiving facility! In 2017, Skydive Long Island will begin a new era of Long Island skydiving at our beautiful new location at the Brookhaven Airport in Shirley, NY. Now under new ownership, Skydive Long Island promises to offer exceptional service, breathtaking views, and unforgettable skydiving adventures! Learn more about our rebrand here. If you live in the NYC metro area, Skydive Long Island makes skydiving NYC easy and convenient. Located just 55 miles east of New York City, we are NYC's closest tandem skydiving center. If you're ready for the adventure of a lifetime, let the seasoned and experienced professionals at Skydive Long Island get you into the air above the Atlantic Coast. This is Long Island skydiving at its best! Our specialty at Skydive Long Island is first time skydivers. If you're looking to "skydive near me" and make your first jump, there is no better place to do it than Skydive Long Island. Our experienced instructors, breathtaking coastal views and easy access from New York City, New Jersey, and the Hamptons have made us the #1 choice for skydiving NYC! Looking for a crowd that doesn't discriminate and revels in an atmosphere of pure acceptance? Consider your local dropzone. 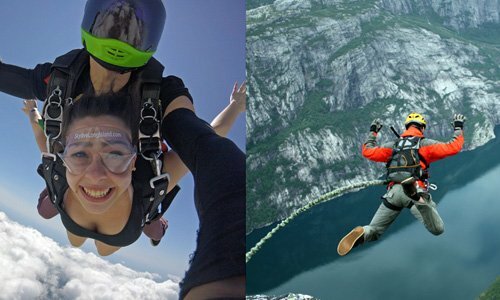 Which is better: skydiving or bungee jumping? They are both awesome sports in their own right, and totally, completely, entirely, 100%, unmistakably different. If you're an adventurous soul, you owe it to yourself to try both! Are you getting ready to make a skydive and wondering what you should sport from head to toe? While there are no specific "best shoes for skydiving", here's what you need to know. We know the conundrum: What to wear for your first time skydiving? It's going to be warm on the ground, chilly at altitude - and you wanna ace that skydiving video. Not to worry - we have your guide to foolproof skydiving fashion that will keep you comfy and looking like a rock star.